Rosegarden includes synth plugin support for sample-accurate synthesis of MIDI tracks. The full audio effects plugin and mixing architecture is available for synth tracks as well, and with it you can be sure that your tracks will sound the way you intended no matter where you take them. 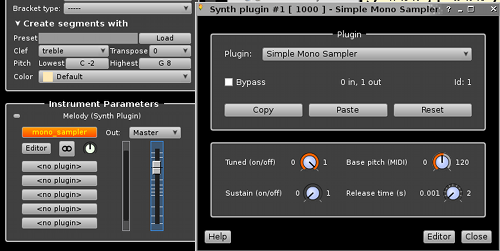 Rosegarden uses the DSSI architecture for synth plugins, a public standard which permits each plugin to be controlled from its own custom GUI as well as Rosegarden's built-in plugin interface. And as well as plugins, Rosegarden can communicate with any number of standalone soft synths for Linux using the ALSA sequencer MIDI protocol.